When we attempt to solve a puzzle set by someone else, we are really attempting to re-modeling our thought processes into the same setup as the author of the puzzle. This is nowhere more true than in exam situations. The candidate is trying to get inside the head of the examiner to deliver the answer they are looking for. This is why, when we understand how a particular problem works, such as a computer adventure game or lateral thinking puzzle, we know the formulae and get complete the tasks quite quickly. I’m quite proud that I can complete the Rubik’s Cube. I shouldn’t be though. I could only figure out how to complete one side on my own. Then someone showed me the moves to complete it. At one point I could complete the cube, from any position, in 30 seconds. It’s a great party trick and a wonderful boast, but am I really being that clever? Does learning a set number of moves, i.e. having a standard set ways of solving a problem, make me remarkable or creative? I think you’ll agree that it does not. Anyone can learn those moves and anyone can then solve the Rubik’s Cube in no time. The point is this: having learnt the moves to solve the cube allows me to solve the cube. It does not allow me to solve any other puzzle. The Rubik’s Cube is a good example as unlike most puzzles it has no set way of solving it. There are as many ways are there are moves, which is 43,252,003,274,489,856,000 moves (i.e. 43 quintillion). Had I worked out the inter-spacial relationships of the elements of the cube and how they moved as the sides were turned, I would have had to engage my brain in a totally different way than I did by following someone else’s instruction. I would have, hopefully, worked out my own method of solving the puzzle. The difference between the two methods would have been that my brain would have been uniquely stretched by the experience of figuring it out from first principles. What if it’s the same for exams? What if the subject is taught as a set number of moves to get to the required answer which is then used in the exam to complete the cube in the set, required way? You might well say that it’s a waste of time, figuring out everything for yourself when you can take the short cut by asking for help. What’s wrong with learning the quick way to do things? After all, it’ll take a long time for students to figure out how to get there themselves, we can give them much more data by handing them the answer which they can easily memorise. That’s true, but it’s also a curse. With somethings it’s right to just hand the student the tool and say, ‘use it like this’. After all, if you were to get a job with the council emptying the town’s bins, they don’t want you having to figure out the most efficient route, they don’t want you to organise the methods of collection and they don’t want you to innovate the machinery. They just want you to do as you’re told and empty the bins. I’ve nothing against binmen. It’s an honourable job in my eyes. The problem is that we might well be training all our people to be binmen. The fact that they don’t all empty bins is irrelevant; they’re being trained to do a particular pre-arranged task in a set way using predetermined tools. And just like me and the Rubik’s Cube, we all think we’re being clever but in fact we’re just maintaining the status quo and working in an environment where innovation is non-existent. Don’t get me wrong, this is often a very good thing. Somebody has to empty the bins. And sometimes the system is so good that innovation is not needed. Look at bees; they haven’t changed how they operate their hives in millions of years, they’ve got such a great system. But what if something changes in the environment? What if a new disease spreads through the hives or human intervention changes the flora surrounding the hives or even moves the hives on lorries around the country? What resources do the bees have to cope with such change? The answer is that they have none. All they can do is rely on the natural selection process of the survival of the fittest in a vain unconscious hope that by some random chance some mutation in their genes might just give them an advantage. Humans don’t (and can’t) operate in that way. The survival of our species, our civilisation and culture, (not to mention your life and business), relies on cerebral innovation: of thinking our way out of problems. Just being able to empty the bins and solve the Rubik’s Cube because someone else showed us how is not going to cut it. Of course we don’t have time in our education (or our lives) to work everything out from first principles. That’s not what I’m saying. In the television series Doctor Who, the executive producer and award winning writer, Russell T. Davies said that they made the decision in 2005 to give back the character of the Doctor his ‘sonic screwdriver’. Decades earlier, a previous producer had taken the magical device away from the Doctor claiming that it made solving the problems in the stories all too easy. All the Doctor would have to do would be use the sonic screwdriver and escape. Russell T. Davies disagreed saying that we didn’t want the Doctor constantly being locked up and the story stalled while he tried to escape. He wanted the Doctor to be able to solve those simple problems quickly so we could all get on to having a more exciting story with bigger problems to solve than just a locked door. Doctor Who never uses the sonic screwdriver to solve the main dilemma of the story. He never uses his Tardis to go back in time and make it easy for himself. He has to use his wits. He has to use his problem solving abilities. He has to use his creativity. We all need to be able to do the same. We need to be taught the basics, how to hold a pen or brush, the rules of grammar and arithmetic, how to kick a ball or hold the violin. We may be interested to know that Hitler came to power in 1933. But we need to know how Hitler came to power in 1933 to have something useful and important. We might learn that E=mc^2 but we need to know how Einstein came to that conclusion to understand its meaning and significance. Traditional education and training in most disciplines purports right and wrong answers as that’s the simplest way to test someone: ask them a question and mark them on whether the answer is right or wrong. The problem with this, if it becomes the standard way of learning is that it programmes the mind that there is a right or wrong answer, that there is a set way of doing something and that getting the answer right is more important than how you got the answer right. This is why I detest multiple choice tests (see my rant on that here) because it frames up the universe into right and wrong, when in fact most of the universe falls into a third category that is neither right or wrong, or both states exist at the same time depending on context. This means that a better answer to many questions may be ‘it depends’. When answering a multiple choice question we cannot say ‘it depends’ even though it so often does. In most cases in life, there is no answer. There is no right answer, there is no wrong answer. When people think they have the answer and force it on someone else, they are often deluded, wrong or only have the so-called ‘right answer’ correct under certain circumstances. A simple enough question, but what’s the answer? Jon Pertwee pulled an entry out of the hat. On it, a ten year old boy had written ‘Davros’. “Wrong!” said Pertwee and fished out another entry, that too said Davros, ‘wrong again’ he said. Nearly all the entries in the hat said Davros. Davros was of course the evil scientist who was revealed in the fictional world of the programme to have created the Daleks. But the answer the breakfast tv show was looking for was Terry Nation, the writer who in the real world created the Daleks in his 1963 script. But even that’s not the definitive answer because what we recognise as a Dalek was designed by the BBC in-house designer, Raymond Cusick. Even that’s not the complete story as the actual props used on television were built for the BBC by a company called Shawcraft. There are also stories that it was comic actor Tony Hancock (who nation wrote for) who came up with the idea that Nation used. If you want to annoy a Doctor Who fan ask them another simple question: how many actors have played the role of the Doctor? Again, the casual viewer might remember that the chap on telly at the moment is described as the 11th Doctor, therefore the answer is 11. But it isn’t. What about Peter Cushing, who played the part in two films? 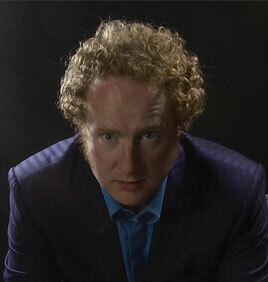 What about Richard Hundall who played the first Doctor in the 20th anniversary special? What about the many actors who have played the role onstage (including yours truly!) in official productions? What about the number of stunt doubles employed in the series? What about the alien impostors in various stories? There’s more than 11. So if you want the ‘right’ answer, you have to qualify the question, then it becomes easier to answer. If you qualify the answer too much it becomes way to easy to answer and it becomes not a real-world question. Real, tough, pressing questions about our lives and our world are not pre-qualified and not laid out as multiple choice. We can’t use the sonic screwdriver or any other prescribed tool to solve them. We don’t learn anything much by learning answers. It’s the same as the old parable, ‘if you give a man a fish, you feed him for a day. But if you teach a man to fish, you feed him for life’. Simply being told the world is round, the sky is blue and the law is the law is really just handing us empty dogma that is really no different to the worst dogmas of old. We need to know how we know the world is round, why the sky is blue and how and why we need to behave as we do. Because if we learn how the universe works, instead of how an examiner works, if we learn how to think for ourselves, rather than become blind faith disciples of accepted wisdom, if we figure out how to figure out and think how to think,we might just find the answers that no-one else has ever answered before. Are teaching and training not quite what we thought? What if we’ve got it all wrong? We believe that a teacher or trainer imparts information which is digested and ‘learnt’ by the student. What if that’s not what’s happening at all. What if the ‘learning’ is a by-product of another phenomenon, a side effect of something else? What if all the theory of ‘learning styles’ is wrong? Could we be looking at it from the wrong angle? When it comes to teaching and training we focus on the information and the delivery style. We collate masses of information that needs to be transferred from our notes and brains to the student’s notes and brains. Yet we all know that people retain only tiny amounts of information just a few hours after the teaching session. We spend ages working out the best way to get the information across and all believe we’ve found the right mix of audio, visual, kinaesthetic, interaction, jumping up and down, shouting, playing, flipchart, group work, powerpoint, dictating and so on. We find what we think is our ‘sweet spot’ of a mix of methods and assume learning will happen. But what if it’s got nothing whatsoever to do with all that? What if, instead, whatever we say, whatever information we impart, whatever delivery style we use, all that is happening in a teaching session is that we are training the students to think like us? What if that is ALL it is? The more the audience adjust their neural pathways to be like us, the more bits of our information stick. The more the student likes the teacher, the more they think like them, the more they want to be respected by them, the more they want to be like them, the more they want to BE them. If our teaching or training fails, is is really because the audience didn’t like us and didn’t want to be like us? Take two of the greatest ‘teachers’ that come to mind, let’s choose Jesus and Gandhi. Both were actually information content poor. There are no bullet points in The Sermon on the Mount. All of Jesus’ recorded works that we have access to are contained in a short historical narrative in one book’s worth, from a teaching career of just three years. Gandhi was equally un-prolific in content creation. He run few lectures, gave just a handful of speeches, none of which were turned into home-study courses and information-products in his lifetime. So how can these two be such great teachers when they taught so little? The answers is that what they taught was not information. Information is a new toy and one that is overrated. Some might say, ‘they taught a message’. No they didn’t. That too is a side effect of us focusing on the wrong thing. We’re so geared to the trees of ‘information’ that we fail to see the wood. What the great teachers taught was how to think like them, and therefore how to be like them. It’s not that they walked the talk (that’s being information focused yet again). It’s that they walked the walk and showed their audiences that walk, by walking it. Everything else was secondary. Everything else was hundreds and thousands (information) on the icing (so-called message) on the cake (the teacher himself). In the school classroom, children learn more about who to live, how to think and how to grow from teachers they like, who inspire them. Children who respect and inspired by a parent want to ‘follow in their footsteps’ – to be like their parent, to be that parent when they grow up. Children look to the role-models of sportspeople, pop stars and celebrities: they want to be like them, they want to be them. Role models give a mould, a model example to follow (whether they actively know it or not). They have the power to inspire (for good or ill) by modifying how the child thinks, therefore how they act as the child uses the one and only, genetic, built-in, human method of true learning: imitation. It doesn’t matter how good the message is if the messenger is uninspiring and unlovable. If the audience don’t want to be like, to think like, to live like the messenger, there is no message. Tony Robbins is an inspiring teacher. He delivers his near-messianic message of personal success to audiences of tens of thousands at a time. He has a cult following that has grown up around him that borders on being a religion, i.e. it has a model for living your life. When people go to Robbins’ events, they may make notes of some of his rhetoric and catchphrases, certainly, but the main things is that they have an overwhelming desire to either be his friend (they feel a close affinity with him and that if they could only meet, they’d be the best of friends) or they want to BE him. That’s why his audience is made up from coaches, trainers and speakers. Those people are attracted to him in the first place but after attending, most people find that their destiny is to BE a coach, trainer or speaker (just like Tony). If a teacher is exceptionally successful we call them a ‘guru’. Originally that term applied to just religious figures but now is linked to people like Tony Robins and others who are exceptionally good at making people think like them. This is why people listen to wealthy people. They want to be wealthy like them. It may be a sad inditement but it’s true. Gurus can be good, bad and neutral. Let’s take The Beatles as being one of the best examples of individuals who attracted unusual levels of adulation. They weren’t teachers in the traditional sense, but with our definition of ‘guru’ their success can be explained in a similar way. Girls wanted to marry them, boys wanted to be them (so that the girls would be attracted to them). It wasn’t just about the music. Many people love Beethoven with a passion. But he doesn’t make them scream. What if teaching is a con? What if it doesn’t actually exist? What if, instead we have gurus who show us how to think and how to be like them? Information will soon become irrelevant. We don’t need to store information in our heads. What we store in our heads is how to get the information we need. Within a generation, people will have a totally different view of information than us and our predecessors in history. Information will be even more easily available than it is now and will be grabbed as and when it’s needed. Personal memory will be used to remember context instead of facts. The question is, will our education systems and our training operations be able to grasp this idea? Will they become an outdated and irrelevant waste of time? If we want to educate people, to improve people, to get them to take the action we think will serve them, to improve society. If we want to give our children the best way to succeed in their lives – we can’t teach them what to do. We can’t train them what to do. We have to capture their imagination and their attention. Then we have to SHOW them who we are so that they think like us. The most important think we can ‘teach’ a child is HOW TO THINK FOR THEMSELVES. Ask yourself the question: is that happening to the children you know? If we are in the so-called information business, the education arena, the training world, we may have to question our approach, our methods, our very existence. Perhaps we need a new paradigm. My conclusion is that we have to be the guru that our students want to follow. We have to be the guru they can believe in. We have to be the guru that they want to become. Otherwise we’re just creating more white noise that wastes time and dulls potential. IF this is true – are we up for the task? Can you ‘walk the walk’? There’s a 52 year old man who claims he invented a character called Davros, creator of the Daleks in BBC TV’s Doctor Who, for a magazine competition in 1972, when he was 13. He said he was shocked to see his ‘idea’ appear on television in 1975. You can read the unlikely story here. 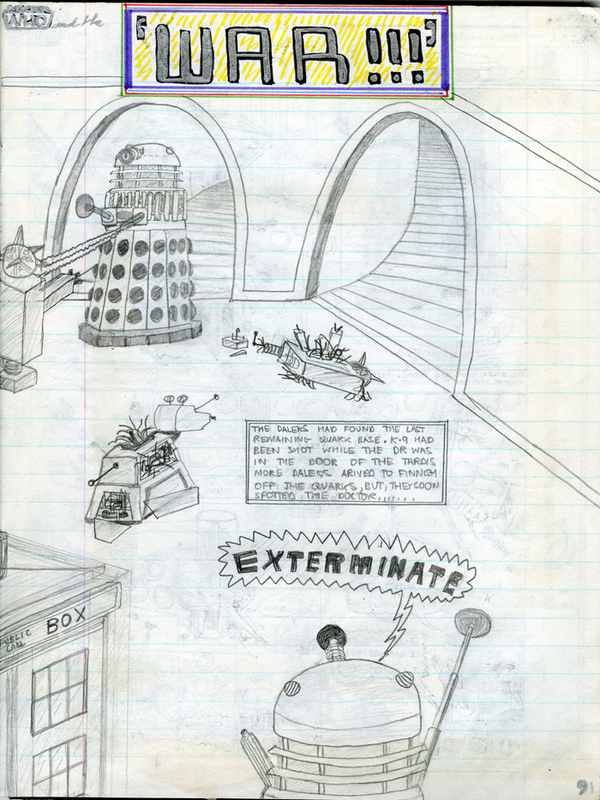 It reminded me that when I was 12, I too was drawing pictures of characters from Doctor Who and in one comic strip I envisaged Davros being given Emperor of the Daleks status and having a spherical top mounted on his base. This was in 1983 and yet it’s exactly what the BBC did on television in 1988. I won’t be making a fuss. 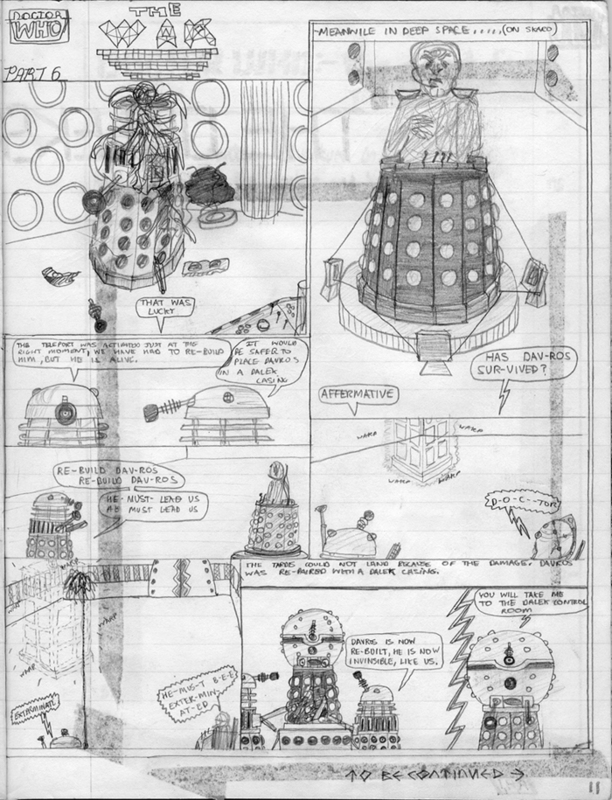 But for a bit of fun I posted the page of my comic strip on the Doctor Who forum. A couple of people on the forum said it was a pretty good effort. It was only then that I realised that that was the first time anyone had said anything complimentary about my drawings. That was not surprising since this was the first moment I’d actually showed them to anyone. Why hadn’t I showed anyone before? Because of the killer reason that people don’t reach their potential. Because I didn’t really think they were really any good. It was one of my early dreams: to be a comic book artist. But I abandoned it aged 14. Why? Because looking at my drawings I was frustrated that they didn’t look as good as my heroes Ron Turner, Dave Gibbons and Frank Hampson. I didn’t have much encouragement. Part of the reason for that is linked to what John Lennon’s Aunt Mimi said to him when he started the Beatles, “A guitar’s all right John, but you can’t make a living out of it”. The understanding of career options by those who offered it to us then and even more so those who offer it to the children of today is frighteningly narrow, short sighted and past-focused. My parents knew you could make a living from being Constable or Lowry – that was proper art. But comic books? Graphic design? That was childish nonsense. And in my case the working class ethic coupled with St Paul (I Corinthians 13 v11), “When I was a child, I spake as a child, I understood as a child, I thought as a child: but when I became a man, I put away childish things” meant that I had to grow up and do something sensible. Reluctantly I did, for a while. Did you? Those two comments on the forum made me think, 18 years later, that compared to the average 12 year old’s drawings, mine were pretty good. The actual story was a pretty good idea too, re-reading it now without the self criticism of the past. So why did I give up? Because when I was 12 I thought that it was talent that counted. I thought that if I was a truly talented illustrator I should be able to do it better than I this. I didn’t know that it was actually practice that made a great comic book artist. I’d been doing it since I was at nursery (and still have the drawings to prove it). I already had hundreds of hours of practice which is why I was pretty good by 1983. If I’d continued with the same intensity from aged 12 for ten years by the time I was 22 I would have been pretty good, if not world class. That’s not a boast, that is just how it works. If you continually work at a process, constantly failing and improving, making mistakes and modifying, you get better and better. Instead, I’m not really much better now than I was then, which was just above average for a 12 year old but just about average for my age now. You just look at someone you know who is good at something, be it writing, football, debating, maths, cooking, whatever. You study them and see how much time they have spend doing the thing that they are good at. Someone once said to Yehudi Menuhi, “I’d give my life to be able to play like you”. “I did” was the maestro’s reply. When it comes to our children we have to realise we can’t make them interested in something they’re not. They have to choose what excites them. And if it’s something we have no knowledge or interest in we have to accept it. We can’t make them practice. If we do they will grow resentful or burn out and lose interest. Our job is to make sure we provide the opportunity to try and explore different interests. Our job is to encourage effort when we see an interest developing. Our job is to make sure that we prevent the child from self criticism of failure as an end and instead help them understand how to modify it into improvement. Through a series of misunderstandings about talent, how the brain works and what motivates people, our society is set up to manufacture regret, resentment, guilt and self-loathing. What was your desire when you were much younger? What did you give up on because of criticism or lack of encouragement? Perhaps it’s not too late for you to pick up the paintbrush again, to kick the ball again, to write that book, to take that course, or to pick up that ‘how to’ book. Perhaps you can re-ignite your passion and build it into your life today? By thinking over what you did right and where you went wrong, who could you inspire today to follow their dreams? In my presentations to both school and business audiences, I ask who is an artist and who is a scientist. The idea of course is that my proposal is that to be creative we have to be both scientist and artist. We need to be able to embrace both logic and chaos, both critical and possibility thinking. At a school recently I spoke to an audience of 14 year olds. I asked the question,’who here is a scientist’. Note this is after I have explained what a scientist is in simple terms – someone able to question, to make judgements, to experiment to search for the truth. Out of a group of sixty, five hands went up (two of those were teachers). I’d already warmed them up so I knew they were capable and confident in raising their arms to earlier questions. Does that surprise you? Perhaps not. But the name of that school had as it’s suffix “school of science”. Science was its specialism and yet know one who attended it was a scientist? Why? My theory is that none of the pupils considered themselves ‘a scientist’ or ‘an artist’ or anything else because those are labels applied only to worthy adults. They hadn’t noticed that if you do science, you’re a scientist. If you do art, you’re an artist. Their version of the situation was that they are pupils. Boring, unimportant, useless and irrelevant pupils. Their job, their identity was to be a pupil. You might well say, what’s wrong with that? I feel it’s so limited and constraining that it’s dangerous. Children adopt this label of nondescript ‘pupil’ as their identity. Then they reach 14 or 15 and are told to choose a route to a job. They used to call it ‘Which Way Now’ with a poster of some inane Radio1 DJ with his headphones on, as if he was some expert in career development. We ask them to choose another label. Do you want to be a doctor or a tv presenter? There probably were a few other rubbish choices. To be a doctor the pathway is fairly clear: you have to be good at everything and then go to medical school. Almost every other profession is less clear. How do I become an archeologist? How do I become a philosopher? Those ‘options’ weren’t on the poster. How do I become head of marketing for a major international corporation? No-one knows. The options are so limited. The reason they are even more limited is that the ‘chooser’ has to make such a leap from generic pupil to sophisticated label. There’s such an obvious chance hat the pupil says ‘forensic science sounds interesting, but I’m not that type of person. I don’t know anything about it.’ Of course they don’t have technical knowledge, but the attitude or ideals probably was there, at one point but was suppressed out by genericness. I went to a large mechanical engineering exhibition when I was seven with my Dad whose company was exhibiting large machine tools. It was called MACH’78. On arrival you were given a name badge which had your name, occupation and company embossed it just like a credit card. How exciting to get my name on such a object! They asked me for my name and typed it into a computer. I was about to give my occupation and company name when they printed the card. Under my name it read: ‘Schoolboy’. I was incensed that my identity had been reduced to something so trivial, and short-lived (I saw my attendance at school as a temporary condition). Perhaps I hadn’t really got it clear in my head exactly what I would have put had they asked me but that’s not the point. I was lucky. My imagination wasn’t dulled by such things. Perhaps a large group of children do still flourish in the same way. But from what I’ve seen at schools I’ve visited, we’re doing a big disservice to so many. What do you want to be when you grow up? What an annoying patronising question.